Please have patience, I’m going to re-post this and try to embed a video. Back in the 1960’s I remember reading a series of history based fiction books. The Series was called, “We were there at- – ” and then the place, incident or whatever was inserted. My Uncle and Aunt had quite a large number that I enjoyed reading while visiting them. 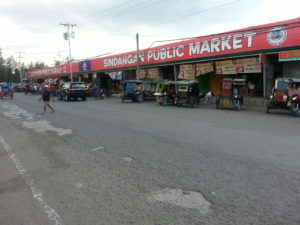 For our post today, I thought I would share a little bit of the flavor of the market area of the town of Sindangan where Inday goes to do the marketing and other things needed for the children’s home. I have a short, 40+ second video that I am not able to insert at the moment, so I will post a couple photos. Please click to open. If this works as desired, I will try more later. This was taken on a Wednesday mid-morning as I was on a bus waiting to go to another town. 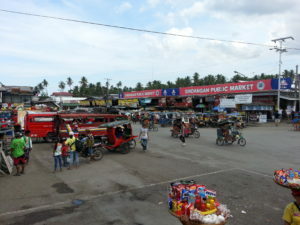 In the background, you will see the public market. It burned to the ground earlier this year. A few things I found interesting as I was people and traffic watching was, how few private vehicles there were, how few traffic mishaps I saw, and how the seemingly random mixing of buses, vans, trucks, pedal cabs locally called bicycles, motorcycles, and motorcycles with a sidecar attached locally called tricycles flowed together. I swear that they must have some grease that they put on the sides and corners of the vehicles as they came so close I was sure that they had hit but nothing happened. In a video I took, I particularly get amused at the motorcycle coming into view from the right around the 20 second point. He is speeding along and almost drives into the side of a vehicle but manages to swerve at the last moment. 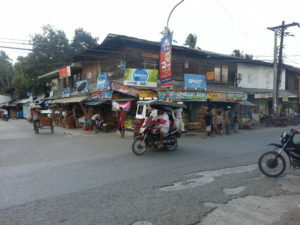 In the background on the far left side of the intersection is a small shelter that is the police station for that area. There were usually 2 policemen sitting there but doing little. The one day that I was waiting for someone right there, I noticed that one of them had one of the oldest M-16s that I had seen in years. The 3 finger flash hider was resting on the floor so much that the fingers were bent towards each other. The intersection at the market showing the other side of the street. At the east end looking towards the intersection.